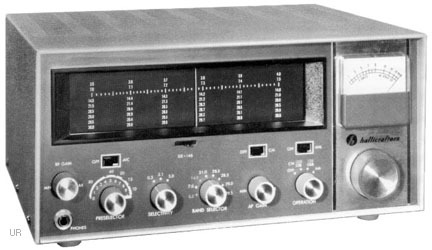 The Hallicrafters SX-146 is an amateur band receiver. The frequency coverage is: 3.5-4, 7-7.5, 14-14.5, 21-21.5, 28-28.5, 29-29.5¹ and 29.5-30¹ MHz. ¹These ranges require an optional crystal. Modes of reception include AM, LSB, USB and CW. Selectivity is 2.1 kHz. This receiver matches the HT-46 transmitter. Features include: ¼" Headphone Jack, S-Meter, AVC ON/OFF, Preselector, RF Gain, ANL, Mute Line, Extl. Osc. Input, BFO, Fiduciary Adjust, Flywheel Tuning and Speaker Terminals. This radio does not have a built-in speaker. The circuit consists of: 6JD6 RF Amp, 6GW8 Audio Amp & Output, 12AT7 Mixer, 6BA6 VFO, 6AU6A IF Amp, 6AU6 IF Amp, 6EA8 Osc. & Premix, 12AT7 AM Detector/AVC Rectifier, 12AT7 USB/LSB Crystal Osc. and 6AU6A Calibrator. 105-125 VAC 60 Hz. 13.125 x 5.875 x 11" 18 lbs. The SX-146 perfectly matches the HT-46 companion 5 band transmitter.